Marine mammal data are becoming predominant in some areas of the World Ocean, most conspicuously in the southern part of the Southern Ocean. The value of these hydrographic data within the existing Southern Ocean observing system is now well demonstrated. Using seal-derived data to constrain a model simulation of the ocean substantially modified the estimated surface mixed-layer properties and circulation patterns in the Southern Ocean. It improved the agreement of the model simulation with independent satellite observations of sea-ice concentration. The oceanographic data collected in MEOP improves significantly the quality of the projections provided by ocean-climate models (e.g. Mercator or Southern Ocean State Estimate). It is already bringing a wealth of new scientific findings, both in marine ecology and physical oceanography. The rapid development of this technology offers possibilities in ocean observations that are just starting to be revealed. Number of profiles per unit of latitude for different sources of hydrographic observations. Ship-based CTD observations (WOD13-CTD, red line) are predominant in the Northern hemisphere, although mostly for continental shelf areas. 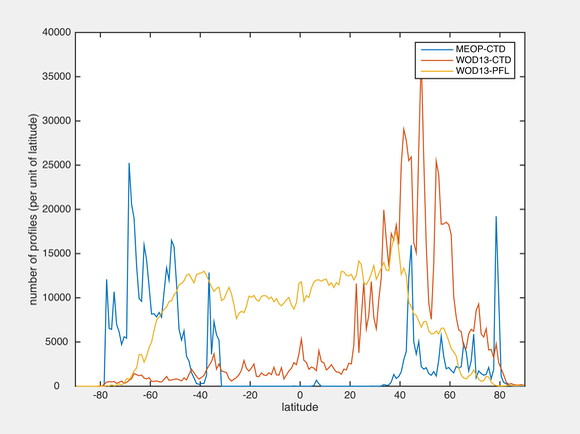 Argo profilers (WOD13-PFL, orange line) provide a relatively homogeneous sampling of the open ocean between 50S and 50N. Seal-derived MEOP-CTD data (blue line) provide a valuable contribution in polar regions, and fill important gaps in the seasonally ice-covered sector of the Southern Ocean. Adapted from Treasure et al. (2017).